1)	How can we account for the stability of a DNA film over a salt solution in which the DNA is soluble? None of the formulations of nucleic acid structure yield a hydrophilic-hydrophobic axis. Since spreading is possible only over strong electrolyte, we might image that we are exploiting the surface activity of pure water relative to strong salt solutions to spread the thinnest possible layer of aqueous solution, and that the DNA molecules interact to form a sheet-like polymer which is less soluble in the underlying salt solution. Note, however, that this film, after being deposited on a solid surface, can be dissolved in water. I wonder whether your model would predict the behavior of the material at an interface. 2)	We observe a thickness of approximately 22 Å whether we "weight" the DNA represented by a given area of film or measure it directly by means of the ellipsometer. Since this thickness is 1.5 times the length of a nucleotide, we speculated in terms of some sort of spiral arrangement. But if there were a single spiral, it should not be very tightly packed, and the thickness calculated from the weight of a given area of film should be less than that observed optically. It seems to us that your model does account for the agreement between the thickness calculated from the two types of observation. I am not certain, from reading your remarks on page 86, what thickness you predict for the 3-helix thread. 3)	We wonder if your proposal does not account for our observation – for which we have had no explanation – that lowering the pH under the film causes it to tend to expand. Would this not be a reasonable consequence of a structure in which the basic residues would be facing the water? The seeming hysteresis of the effect of lowered pH is something else again, and here our data are incomplete because we did not determine the pH limits within which the pH effect was reversible. We would appreciate very much any comments you might make on these questions and would at the same time hope that these data, representing a somewhat different experimental approach from those that you cite, might be of some use to you in further elaboration of your theory. I hope that the points we have raised will be intelligible despite the chemical illiteracy that they reflect. I must add that all the credit for the technical accomplishments in the enclosed paper should go to Mr. James. Letter from LP to Dr. George Kistiakowsky of Dept. of Chem., Harvard U., RE: writes in response to Dr. Kistiakowsky his opinions of the scientists listed in his letter, describing their class in the field of their science and how he thinks they would contribute to Harvard U. Suggests some men of his own as well for the professorship opening at Harvard U. [Letter from Dr. Kistiakowsky to LP January 29, 1953, letter of response from Dr. Kistiakowsky to LP March 17, 1953]. Letter from LP to Prof. R. T. Sanderson RE: in response to Prof. Sanderson's letter, he sends a letter in honor of Prof. Cornog and his upcoming retirement. 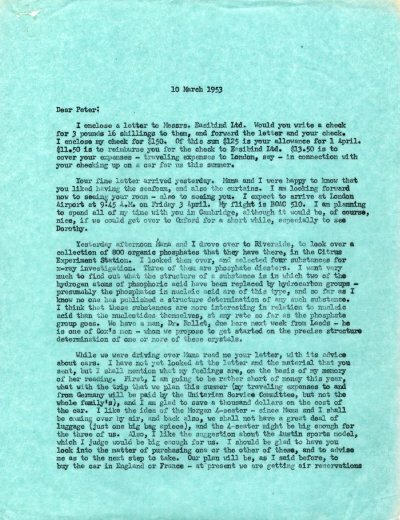 [Letter from Prof. Sanderson to LP March 4, 1953, letter of response from Prof. Sanderson to LP March 24, 1953] [Filed under LP Correspondence: Box #379, Folder #1].